I have heard of many people, including my friend Leslie, who read Christmas books with their kids every day of December. I think it’s a sweet idea and the other night while I was looking for a good book to read for bedtime, I realized we have plenty of Hanukkah books to be able to read one each night of the holiday (if not more!). We are members of the PJ Library, an organization that sends Jewish themed books to free every month! We have collected almost all of our Hanukkah books through their mailings. Here are (at least) 8 Hanukkah books that we own! “Although Bubba Brayna is almost blind and deaf, she makes the best potato latkes in the village. On the first night of Chanukkah, she cooks a special batch for the rabbi, who is coming to visit her. When she hears a thumping at the door, she lets in her guest. Only later does she realize she has served a bear her delicious latkes!” My kids thought this book was hilarious! Bubba Brayna talks to the bear the whole time thinking he is actually her rabbi. 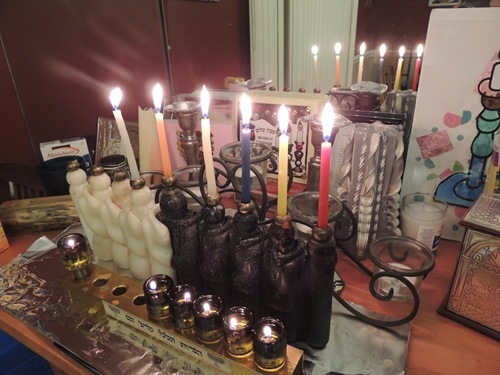 “On the first night of Hanukkah, Rabbi Judah has too much to do and too little time to do it. Before the rabbi leaves to visit the emperor, he tells his housemaid Basha that she can ask the golem to help. While the golem makes latkes, Basha decides to visit a friend. Basha is having so much fun with her friend, she doesn’t realize that latkes are pouring out of the rabbi’s house, sending people running! Will Rabbi Judah come up with a solution to control the golem before it’s too late?” We just received this one last night! Really it’s not about Hanukkah, but it does talk about latkes, so it fits the bill! “Gabi is thrilled to receive a new tricycle as a Hanukkah gift. After falling off the trike and scraping her hands and knees, she’s afraid to try again, but finds courage by remembering the bravery of the Maccabees.” I love how this book ties in the story of Hanukkah with a lesson about being brave. My kids are timid by nature when it comes to things like riding bikes, so I think this one was totally meaningful for them! They also loved the name of the main character – although Simon wasn’t sure if the girl in the book was actually Gabbie or not! “Violet and Simon, two small bunnies, are excited about Hanukkah. Simon is ready to light all the candles and then blow them right out! 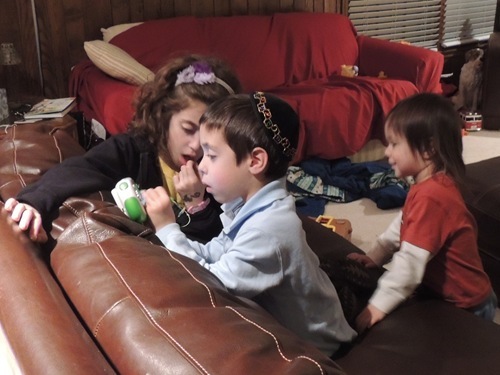 But Mama and Papa explain how to celebrate Hanukkah by lighting one candle each night at sunset and placing the menorah in the window for all to see. Grandma and Grandpa come over, too, and there are latkes and presents and a dreidel game.” A very cute book – also featuring a character named Simon! “At the dreidel-making workshop, Jeremy’s friends think he’s molding a secret code on his clay dreidel. But he’s really making a special gift for his father, who is blind. How will he get his friends to appreciate his special dreidel?” This is another new one to us. And another with a sweet message. Jeremy uses Braille on his dreidel for his father who is blind and thus teaches kids about a way blind people can read. Although our copy is called Jodie’s First Dig, I believe this is the same book. “Jodie dreams of one day becoming a famous archaeologist. When her father takes her on a dig in Modi’in, home of the Maccabees, she is able to participate in a unique way.” This is another book that is not really about Hanukkah, but the historical significance of Modi’in makes it Hanukkah related. A cool fact – we have friends who live in Modi’in and we have been there! “A blizzard leaves a peasant family housebound at Hanukkah with the potatoes for latkes buried under the snowdrifts. There are no apples for applesauce, either, since the harvest was poor. But when the family takes in first a stray cat and later a stray dog, the two animals return the favor. On the eighth night of celebration, when the storm finally clears and the nearly starving group ventures out, the dog digs potatoes and the cat mews in the apple tree where apples are miraculously now hanging.” We just read this one last night! It’s a good story with a lesson about people who do not have much but are willing to help others (in this case – animals). “Jacob loves his brother Nathan, who is autistic. When Hanukkah comes, Jacob worries that Nathan might embarrass him in front of his new friend. What if Nathan blows out the Hanukkah candles? !” This is in our to be read pile for this week. It is another Hanukkah book that teaches about different types of people and I am hoping my kids will appreciate it. “As Rebecca Bloom prepares for a Hanukkah party at the synagogue, three latkes jump right out of her frying pan. They head straight for the door, singing, “Big and round, crisp and brown, off we roll to see the town! And YOU can’t catch us!” And so begins the chase. The sassy latkes roll out of the synagogue and through the town with Rebecca and a growing crowd in hot pursuit. Their travels come to an end at Applesauce River, where, by a modern-day Hanukkah miracle, the water actually turns into applesauce–the perfect bath for three crispy latkes!” This is a latke version of the story of the gingerbread man. Also in our pile to be read this week. “The Ziz, a huge and clumsy bird, helps the Maccabees find enough oil to light the menorah and restore the temple, leading to the miracle we celebrate every Hanukkah.” The Ziz is a strange bird – we also have another book about him! He learns about Jewish holidays through his mistakes. So we have received a total of 12 Hanukkah books from the PJ Library and going through their list of books, I see that there are even more Hanukkah books we have not yet received! Wow! There are also many other Jewish books that we have received and not yet received which can be found on their list. In the past, we have also received Hanukkah music! My kids insist on leaving this CD on rotation all year round. However, if I was to recommend any one Hanukkah song to check out, it would be this one! Since I’ve done this every day so far, here are the pictures from night #5! These presents come from Gramy and Grandpa! 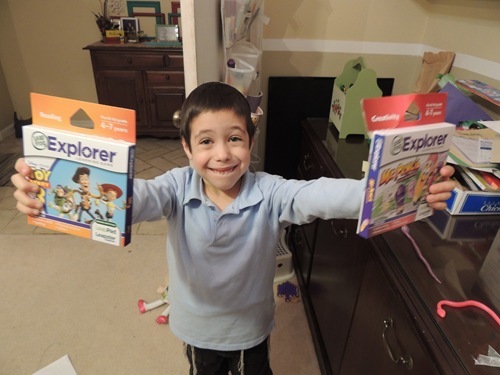 I missed a shot of the exact moment Zachary saw these Leapster games – he said “This is exactly what I wanted!” This is his silly happy face! They were all very interested in Mr. Pencil! 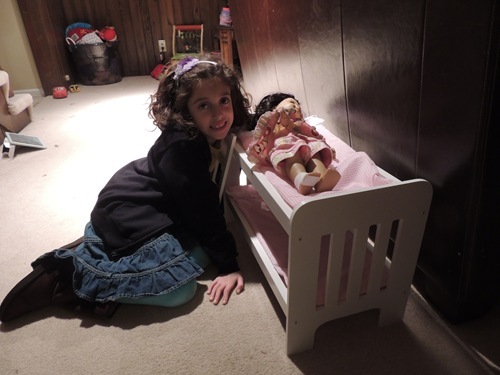 Gabbie got a bunk bed for her American Girls – not from American Girl! After Hanukkah I will recap all of the presents and where they were from! It always makes me sad to add the candles on the other side of the middle one. It means it’s more than halfway over. Simon DID get a present, but it did not have batteries, which I failed to notice when it arrived. So I will get pictures of it when the batteries are added – I know he will love his present!